Lake Orta villas - Spend your vacation by a dreamy Italian lake! If you are looking for a humble and off-the-beaten-path travel destination, try a Lake Orta villa. Morning mists fill this favorite weekend escape, and you know you have stumbled across something special, because it is also the choice of native Italians for a relaxing and fun-filled getaway. This gem is one of the smaller lakes in Italy, and with an area of eight miles long and two miles wide, it is the sole Italian lake that rests entirely in the region of Piedmont. 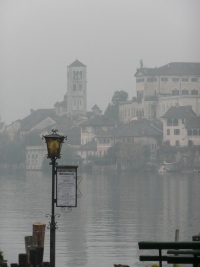 Lake Orta is also a place of devotion and serenity. Find yourself surrendering to the peaceful aura of Saint Francis as you meander among the terracotta sculptures that depict his life. These invigorating works of art are scattered throughout the twenty small chapels of the Sacro Monte church high above the town of Orta San Giulio. This endearing and car-free town nurtures your imagination as well as your unique vacation experience in a Lake Orta villa. You will return to Orta San Giuilo time and time again as you admire its charming buildings, painted in a rich cream color with matching thick slate tiles adorning all of the roofs. Dusk is a special time on Lake Orta - treat yourself to dinner at one of Orta San Giulio's exquisite local restaurants, where your palette will rejoice as you enjoy the breathtaking view of the Isola San Giulio. This island, located in the middle of the Lake, is lit up like a Christmas tree in the evenings, and holds its own treasures just waiting to be discovered. A Benedictine monastery on the island invites you to "Follow the Way of Meditation" and you will find yourself surrendering to the open and loving mentality that seeps through every crevice of the towns, churches, and streets of the lake communities and right back to your Lake Orta Villa. 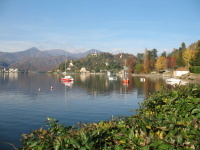 Look for a Lake Orta villa rental - Enter your travel dates and preferences and select one or more lakes to search. Send us an inquiry or reservation request when you find properties you like. Want some assistance from our Lake Orta specialists? Complete our simple contact form - We have seen nearly all of these properties, so we would be very happy to share our knowledge and experiences.